JGarden Description: Polson Park is a large recreation and leisure park on the south end of Vernon. You'll have to drive through some winding roads to find the Japanese garden which is carved out of the southeast corner of the park. The space is shaped rather like a penninsula of land surrounded by an asphalt road on three sides. Ducks, geese and pigeons jam the road with more congestion than an urban highway during rush hour. 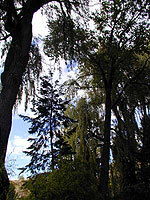 Five enormous willow trees separate the garden from a large lawn and the rest of the park. The center of the garden is dominated by a moderately sized pond with a pebble beach at one end. What impressed me most about this garden was the attempt to integrate native species with Japanese varieties. But on the whole, it's not been well maintained and the quality of the construction leaves much to be desired. The pond in the center of the garden has poor circulation. The base of the pond is relatively cheap cement. It looks like there were a couple of bridges originally, but only a cement one remains. The second one has only its abuttments to speak for its former presence. The conifers have been trimmed but in an amateurish fashion, leaving them looking gangly and awkward rather than graceful. The builders of this garden undoubtedly had grand ambitions, but the garden's location at the far end little traveled corner of a very large park, attests to the lack of political and financial clout necessary to maintain such a structure. Despite being a small town, Vernon does boast some attractions other than Polson Park and the Japanese Garden. A few highlights include a 'Taoist Tai Chi Garden', the Vernon Art Gallery, the town's Museum and Library and the Interior Space and Science Center. of things, but something more than these.